After two days of violent protests in Chongqing that involved thousands of people, leading to overturned police cars, clashes with police, and unconfirmed reports of several deaths, the streets had been mostly cleared, and only questions remained about what set off the incident and how it escalated so quickly. Chongqing is the former stronghold of Bo Xilai, the recently ousted and disgraced member of the Party’s Politburo. The protests took place on the same day that it was announced that Bo would be suspended of his Party posts. 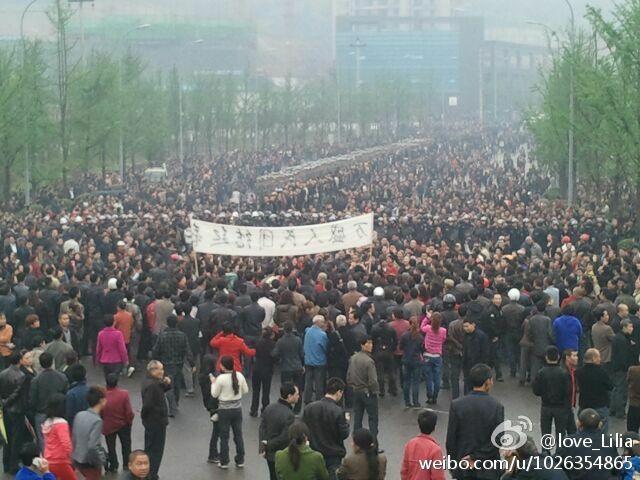 More than 10,000 protesters gathered in the Wansheng economic development zone in Chongqing on Tuesday, April 10. Protests persisted throughout Wednesday, but were apparently shut down by evening. Protesters were reported to have overturned and smashed police cars. Videos and pictures uploaded online show armed police dressed in combat fatigues being pelted with rocks. Netizens also posted online pictures of bloodied men and women who had apparently been struck with the metal batons of police and armed police. Videos uploaded to YouTube from one pocket of the protest show two women being chased around the crowd by a baton-wielding policeman, who deals several blows to the back of one of the women. The Epoch Times reached Mr. Yang, one of the protesters, on Tuesday, who said that the violence of the police against young people and the elderly angered many, and led to more people joining the protests. A resident of Wansheng, Mr. Fu, also reached by The Epoch Times, estimated that over 1,000 armed police were dispatched on Tuesday April 10, along with 40 or 50 police vehicles. At various times during the incidents police fired rounds of tear gas into the crowd, making over a dozen arrests, he said. “They dispersed a lot of people, but after awhile they came back again,” he said. According to a Chongqing City spokesperson, 12 police cars were turned over and smashed, and four were set ablaze. The protests erupted on Tuesday, the same day that the announcement was made that Bo Xilai, the former renegade Party secretary of Chongqing, would be ousted from the Chinese Communist Party’s Politburo and its Central Committee, two of the regime’s key power organs. Protesters were said to have been concerned with amalgamation of their district, Wansheng, with another district, Qijiang. Li Tao, a Chongqing resident, said in an interview with The Epoch Times that Wansheng is economically developed and has abundant supplies of coal, whereas Qijiang’s economy is not as prosperous. After the amalgamation under Bo Xilai late last year, Wansheng residents suffered a decrease in their health insurance and retirement benefits, Li Tao said. On Wednesday, Xinhua, the regime’s mouthpiece, reported that the protests had died down. Local Chongqing authorities published a series of “Eight Beneficient New Policies,” promising to boost social benefits, in an apparent attempt to placate the protesters. But the timing of the protests, and to some extent their content—in one video the individuals gathered break into a hearty rendition of the regime’s national anthem–have raised questions about the connection between the protests and Bo’s ouster. Searches for the terms “Chongqing,” “Wansheng,” and “Qijiang” have all been blocked on Sina Weibo, a Chinese version of Twitter. Aside from the apparent concessions of Chongqing authorities, it may have been the strong-arm tactics that kept some protesters away on Thursday. With reporting by Tang Ming, Jing Hui, Gao Zitan, and Qiao Qi, and research by Ariel Tian.